Today, yet another study emerged that proves Facebook causes depression, and the more someone uses it, the more depressed he or she becomes. This new study comes from the University of Michigan, where researchers observed 82 Facebook users during a two week period. They found that the more time a person spends on Facebook, the more his or her feelings of well-being decrease and feelings of depression increase. We were able to show on a moment-to-moment basis throughout the day how people’s mood fluctuated depending on their Facebook usage. We measured lots and lots of other personality and behavioral dimensions, like, for example, frequency of Facebook use, but none of the factors that we assessed influenced the results. The more you used Facebook, the more your mood dropped… The negative effect of Facebook use on happiness became more pronounced the more you interacted with other people within that time frame. In fact, not only does Facebook cause depression, it also causes what’s known as the “fear of missing out.” This is marked by the feelings of inadequacy someone experiences when they see members of their social circles posting photos of fabulous vacations, expensive purchases and even adorable children. Feelings of jealousy and resentment often pervade when observing the positive things in others’ lives. Those researchers on that study did note, though, that after adjusting for certain factors, the significance of the self-esteem piece became correlative rather than causal, because the lack of self-esteem could be caused by other things such as gender or low socioeconomic status. So Facebook makes us depressed and narcissistic, and harms our overall self-esteem. Setting studies aside for a moment and speaking on an anecdotal level, how does it feel when you post a status update and no one responds? Or how about when you post an achievement you won, an article you wrote, or an artwork you completed, and a “friend” says something nasty about it? Have you ever stayed awake longer than you should have because of something someone said to you (or about you) on Facebook? When thinking about how these feelings can compound over time, it is rather easy to see how terrible Facebook can make us feel. 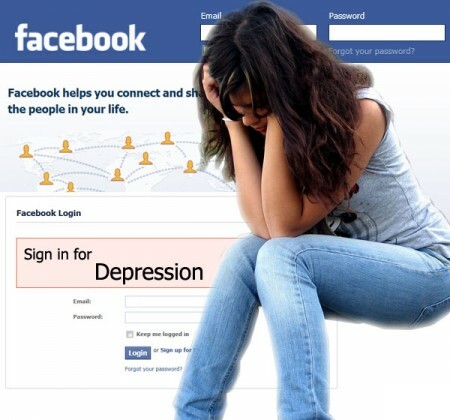 A new study says Facebook causes depression. Maybe it’s time to click to close button on Facebook and have more real-life interactions from now on. 44 Responses to "Facebook Causes Depression New Study Says"